Along with other officials, The State chief led the ground breaking of the new bridge in Lanao del Norte. 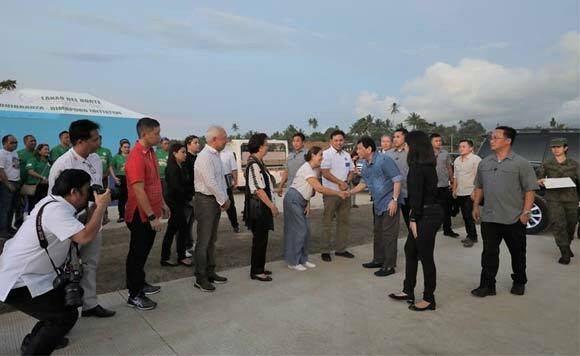 President Rodrigo Duterte recently graced the ceremonial ground breaking of the 3.772 kilometers Panguil Bay Bridge. Along with Department of Public Works and Highways’ Secretary Mark Villar, National Defense Secretary Delfin Lorenzana, and Ambassador Han Dong-man of the Republic Korea, the Politiko joined Lanao del Norte Provincial Governor Imelda ‘Angging’ Quibranza-Dimaporo in inaugurating the bridge that will link the Municipality of Tubod, Lanao del Norte and Tangub City / Ozamis City, Misamis Occidental. Said infrastructure is said to reduce land travel time from 2 hours to 7 minutes which will promote economic activities in the areas. Also present during the event was 1st District Representative, Congressman Mohamad Khalid Quibranza Dimaporo, 2nd District Representative, Congressman Abdullah ‘Bobby’ Dimakuta Dimaporo, and Tubod Municipal Mayor Leoncio Bagol. Zia Alonto Adiong throws some shade: Masama yang chongki!